Have you thought about riding your bike to school? You make me feel so guilty! 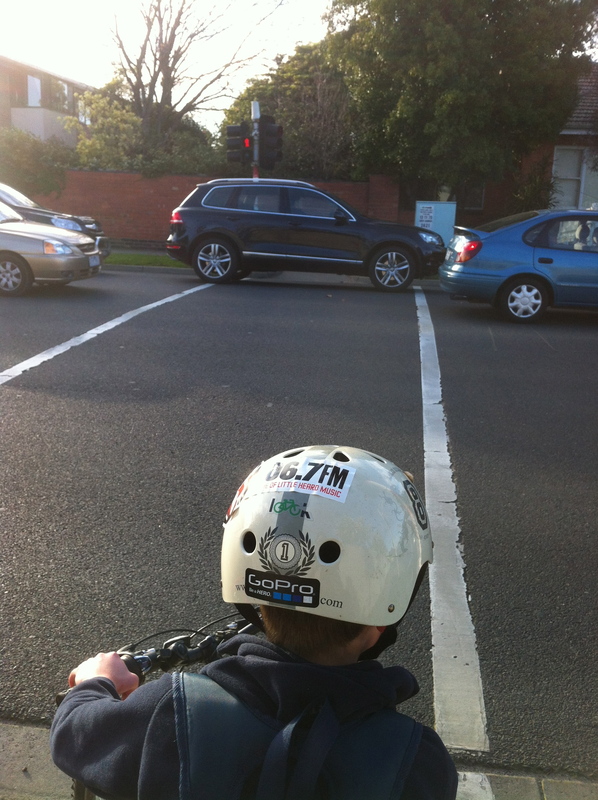 called one of the Kew Primary mothers as we rode past her closing the door of her car! I don’t want to make anyone feel guilty, but perhaps just remind people there are different ways of getting around, including going to and from school on a bike. My family tries to ride to and from school as often as possible. We got into the habit of riding while living overseas – but not in Europe as you might think. We lived in Boston and its public transport just doesn’t compare to Melbourne’s. So we ended up riding everywhere, even when the temperature was close to zero. Just watch out for that black ice and snow in the gutter! We are very fortunate to have two very active boys who have no concept of sleeping past 6.00 am – and that’s a good morning. So from a very young age we have had them out on bikes trying to exhaust them. Our trip to school is about 2 kilometres and takes about 20 minutes. Much faster than walking, especially with a prep! There are definitely both positive and negative aspects to bike riding to school. Here are some ideas that we’ve come up with as a family. Makes kids more self-sufficient, independent, responsible and confident. Faster, easier and cheaper than driving: no time spent circling the streets for a park or leaving extra time to make sure you can get a park. Incidental exercise: you are exercising while going somewhere – and it might not be high heart rate stuff while riding with the kids, but you can do that on your way home again or on your way to work, rather than driving from school to the gym after drop off! Cheaper than taking public transport: while public transport is better for everyone than driving, those Myki cards have a habit of sucking money out without you even noticing – and how often is the bus on time anyway? We don’t have a shelter at our bus stop so even if we don’t ride when it’s raining, we still get wet! Fresh air, peace and quiet: we take the back streets, after a short stretch on Studley Park Road and it’s just lovely riding past all those glorious homes along tree-lined streets – makes you feel very lucky to live in Kew! Smiles from pedestrians and even car drivers: tell me, what is so amusing about two young boys on bikes with their mother trailing behind, loaded down with school bags? Cars giving way to bicycles: so many times we have cars try to wave us across streets we are about to cross (see negatives below for another perspective on this). A short local ride means you can do it in civilian clothes: no need to get changed or have special gear. 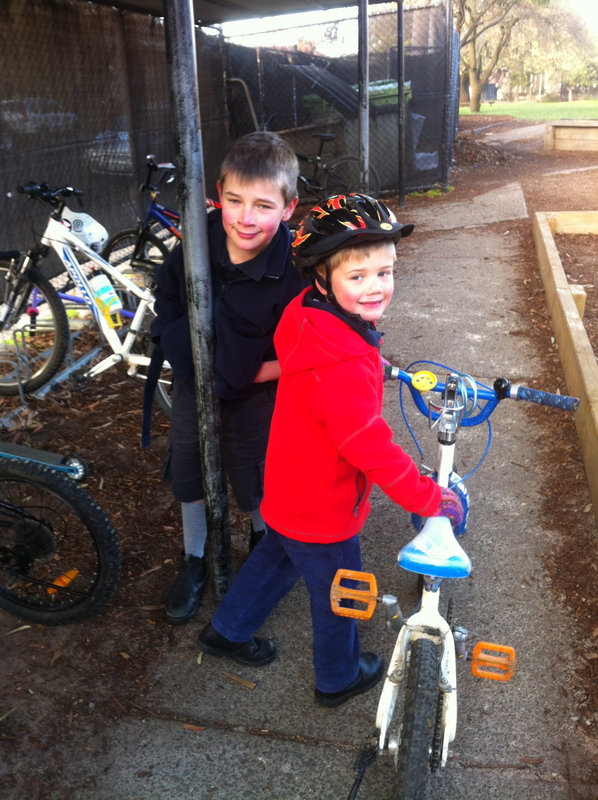 The kids arrive at school energised and ready to learn – and apparently research shows that they have higher concentration times than those who don’t ride. Having to look out for cars in every driveway, even when you think you know most of the peak hour movements of the houses you pass – there’s always an exception. 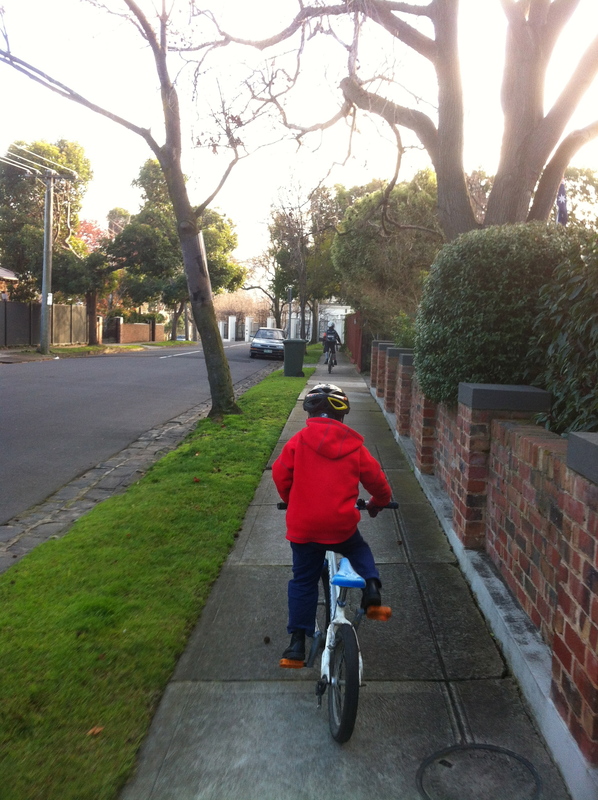 Disciplining young racing riders – there is a reason there is no Tour de Kew at 8.30am or 3.45pm on weekdays. Dirty school clothes, especially when it’s drizzling or raining as kids’ bikes don’t often come fitted with mudguards. Multiple stops in one outing to or from school are trickier: a bike basket (or two) is very useful for shopping after school drop off or pick up, but they probably won’t be enough for a big weekly shop. Generally needing more gear: helmet (see next item! ), gloves for those cold mornings, rain jacket, socks into which to tuck your pants or a bike that will accommodate skirts, a bike lock, lights (I have dynamo lights – no more batteries!) – but you don’t have to have lycra! 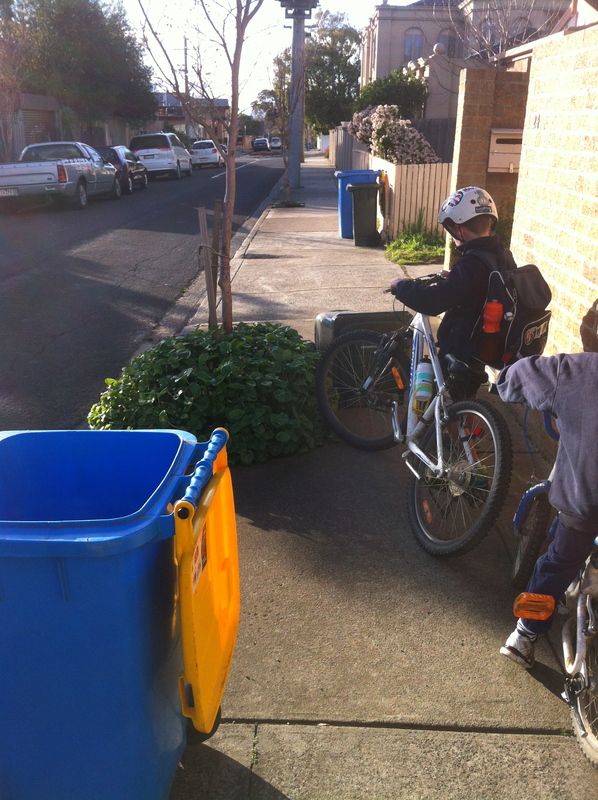 Obstacles on the footpath: builders are clueless about gates, gravel and where they park their trucks but then all that affects pedestrians too – as do rubbish bins so we take extra care on Fridays. 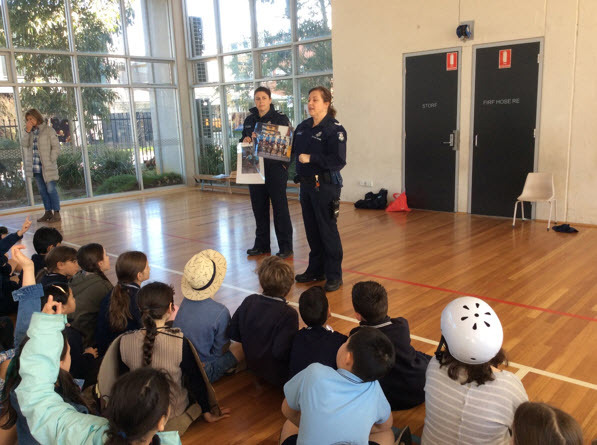 Every year, Erin Willett, our marvelous PE teacher, coordinates the Bike Education program for Year 3 and 4. This year Erin will run it early in Term 4 to take advantage of better weather (hopefully!). The program will run for four or five weeks on a Friday and will finish with a ride from KPS to Hays Paddock. Erin is looking forward to getting lots of parents to volunteer to help and she is about to get the 15 KPS bikes serviced for kids who don’t have their own two wheels. 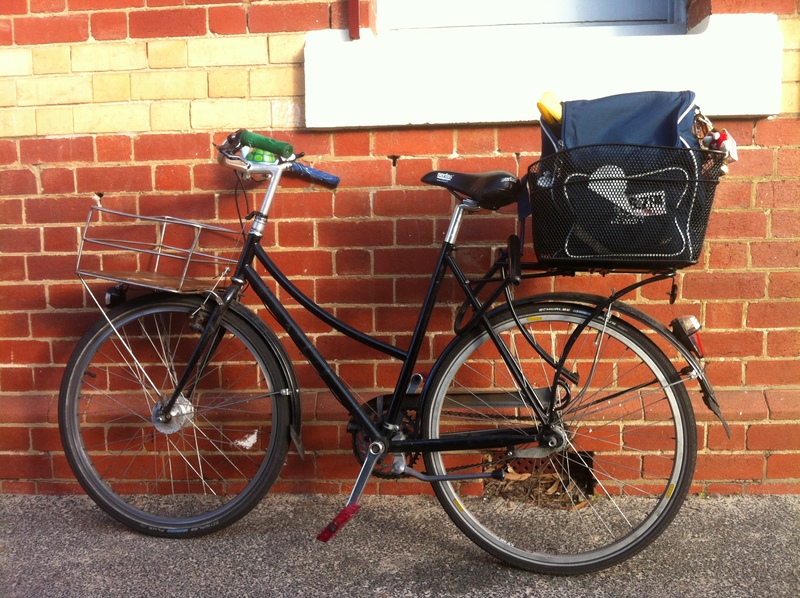 Erin would like to get bike parking under the shed next to OSH so kids can come in from Peel St and park conveniently. We’ll be looking at that again on the Building and Grounds Subcommittee. The bike parking on the Pakington Street side of the school is looking beautiful after a clean-up at the recent working bee. Then we have the annual National Ride2School Day which is usually in March. That’s a great opportunity to get out your bike even just for one day for getting to and from school. And of course we all know that we must never ride our bikes or scooters in the school grounds. 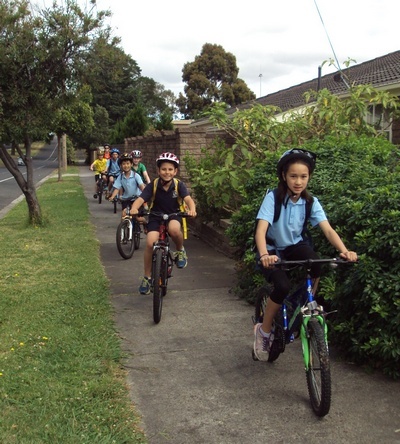 Bicycle Network Victoria has lots of suggestions of things we could do as a school community to raise awareness of cycling and increase the number of children riding to school. Increase our participation in National Ride2School Day in March each year. Hold a Wheel-a-thon as an alternative fundraising idea: kids get sponsored by family or friends to ride (or walk) to school for a day, a week or a month. Ride to school during Walktober, on Walk to School Day and National Ride to Work Day. And then we also are very lucky to have a parent at KPS who knows a lot about all of these issues: Mark Stevenson, father of Hugo in Grade 1, is director of the Accident Research Centre at Monash University. 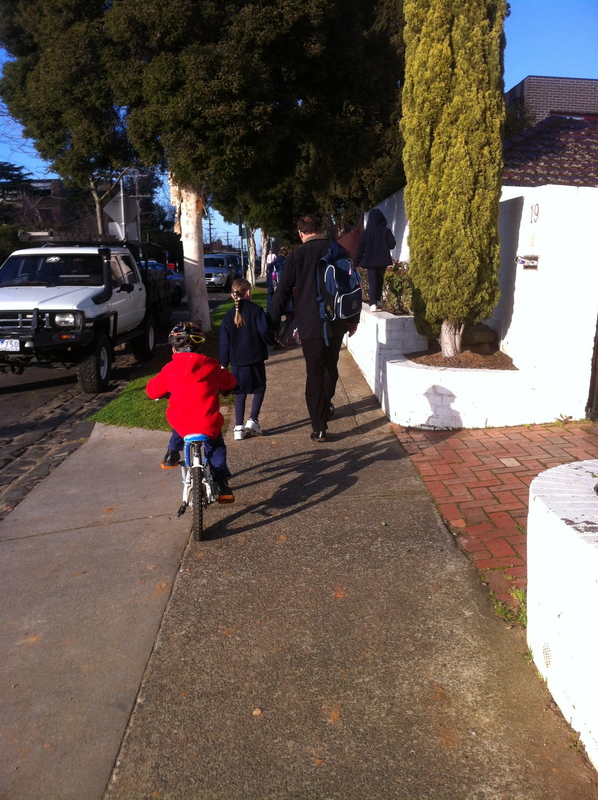 Mark says we should do more Ride2School Days as a school because his recent research shows that we need more groups of riders to encourage sharing of our roads – even if it is just crossing our local streets! So maybe we should start with a Ride2School Day in Term 4 where we organise groups of riders to meet at specific places and ride to school together. We could even coordinate it with Erin’s Bike Ed program and encourage other year levels to join the Grade 3 and 4s. Let me know if you are interested (kath.phelan@gmail.com).